This week for my Looking Outwards, I decided to look at Shannon‘s Looking Outwards post from Week 1! For her post, she looked at a sound reactive light installation by Nocte that was created in collaboration with the designer Roland Ellis. Nocte, creates light installations and responsive environments in order to engage their audience in a unique experience. Roland Ellis is a British designer based in Somerset House out of London. I really liked this project because it engages two different senses together. The lamps are digitally controlled, and live audio can control the animations. It is both seemingly simple but complex. I was not able to gather too much about the details of how this installation actually works, but I thought it was an amazing interactive work. I also thought that Shannon’s original Looking Outwards post was thorough and detailed, and I learned a lot just from reading her post and perspective! For this week, I looked at Shan Wang’s Looking Outwards post from week 5. The project called The Third and the Seventh by Alex Roman, a Spanish CG artist, is a 12 minute movie that illustrates architecture through series of images which he utilized rendering programs such as DSMax and V-Ray and texture work in Photoshop to create. His sensibility of clarity and light is apparent throughout the film with incredible reality of details, none of which has been filmed. I agree with Shan that the artist’s aesthetic sensibility and the techniques created a fascinating project that interestingly convey a feeling of 3 dimensional, spatial feeling in a 2 dimensional display. And to add on to that, especially after watching the film, Roman’s intricate use of the movement of light and shadow throughout his film as well as the composition is what I believe gave visual depth to this production. Today I am responding to Sihan Dong’s looking outwards on the Tilt Brush project . Tilt Brush by Google, created in September 2014. The Tilt Brush project idea is fascinating and I am impressed with how much virtual reality can do for us. I agree with Sihan’s comments about the basic facts of the Tilt Brush. I also like how she talked about how the tilt brush’s function in adding in the audio element to virtual reality is going to attract more people to experience VR. It is also true that Tilt Brush does not let the public in on their algorithm which I hope they did because the idea seems very interesting and magical to me. One thing that I would like to add is a brief explanation on how this works. Which can be found on the website. I recommend this addition because I don’t completely understand how the brush works when I first saw the video as the concept is a bit vague. Also it would be great to add the year and creator of the tilt brush. In looking through previous Looking Outwards posts, I found Shannon Case’s post on Anna Powell-Smith, a web developer. 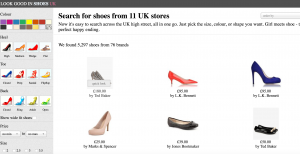 Shannon links to a website that Powell-Smith designed, which gathers shoes that are being sold all over the UK, and places them in one repository that can easily be searched through, with filters that range from the ordinary (size or price), to the more creative (style, color, toe, heel, back). I think that the cited project is really quite interesting, and I very much respect Anna Powell-Smith for her work. But I disagree with Shannon that this a project to admire. While it is a change of power dynamic from usually male-created capitalistic ways of selling women products, it is simply a website that links to more things to further perpetuate our consumer society. What interests me a lot is this post DENISE JIANG-LOOKING OUTWARDS 06. 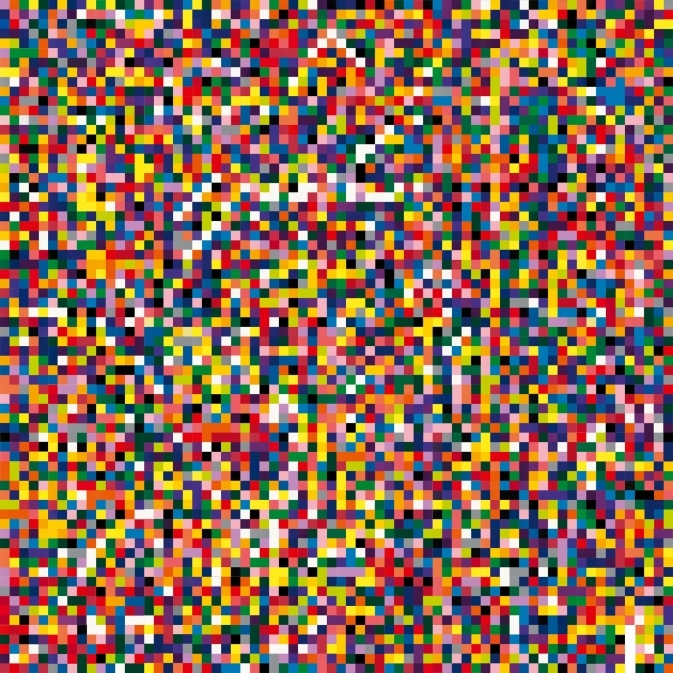 Randomness can be represented in many ways, such as forms, shapes, colors, arrangement, but in this work, when it is static, everything is organized with a rigid pattern(without randomness). I agree with the author said “circles are organized in a rational way but the movement is not”. I admire this work because it keeps simplicity in its original form (the colors of the circle, the most simple geometry, and gird arrangement)which contrasts or highlight the movement. In this post I’ll be looking at this Gerhard Richter painting, entitled 4900 colors, from this Looking Outwards post. in the original post, the author pointed out that even though every color in this piece was chosen at random, the painting still seems to evoke something. I agree, and I think that the way people can find patterns in things that are totally random is really interesting. In this painting in particular, the white squares look like the outline of some sort of object to me, and I think that by curating random elements so that some of them contrast in neat ways with eachother, artists can create very evocative works of art through random processes. I also think it’s interesting that this piece, with each square painted at random, is indistinguishable from paintings where the artist chose colors deliberately. This kind of serialized art could potentially be made without an artist at all, and that’s cool to see in a very ego-driven medium. Richter’s work can be found here. Mass Effect looks like a beautiful game with wonderful graphics and a compelling storyline. I agree that the game showcases the artistic side of games, as it has incredible characters and stories as well as beautiful visual aspects. I would have liked it if she had mentioned how the game was designed to appear as a continuous cut scene, because I believe that is a very interesting and unique design. The game was developed by Bioware and published by EA games. The post that I thought had an interesting yet simple concept was found in Vtavarez‘s week 4 post. He wrote about how an artist made a graphical representation of a musical composition called He’s a Pirate. I listened to the soundtrack and it was the one from Pirates of the Caribbean. If you click on the link, then you can see that the The Wrong Way to Draw a Pirate is a animation of how the song comes to be. In the past LookingOutwards, I loved when we analyzed the relationship between sound and animation and this is just another example of how cool these things can be when they are illustrated clearly. The person who made this composition has made a series called The Wrong Way to Draw Music. On there, they have many different types of songs that are portrayed the same way as the Pirate song was. I do agree that the way that the song is drawn, could have been better. All the layers that were written before hand just get layered over by new sounds and pitches. However, I still think it was a really cool idea.